Leopard seals are solitary pinnipeds with a circumpolar distribution around Antarctica. 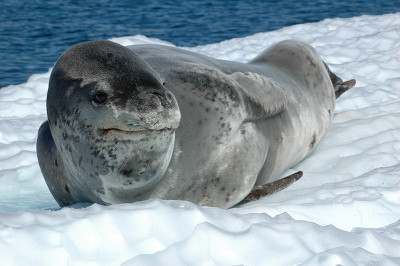 The majority of the leopard seal population occurs near and within the Antarctic pack ice. These seals have a long, muscular body and a large head and mouth. Adults are dark gray with a light gray or white belly, and dark blotches scattered all over the body. Adult females are typically larger than males (sexual dimorphism), reaching a length of 3.8 m (12 ft) and a weight of 500 kg (1100 lbs). Males typically measure 3.3 m (10 ft) and weigh 300 kg (661 lbs). Leopard seals are one of the top predators in the Antarctic ecosystem, feeding on a diversity of prey including penguins, small seals, squid, fish, and krill. During the austral summer (November to January), leopard seals breed on the outer fringes of the Antarctic pack ice. Both sexes are highly vocal during this time. Their vocalizations are often described as “trills” and “hoots” and consist of short-distance “local calls” as well as long distance “broadcast calls”. Since leopard seals occur at low densities throughout the pack ice, finding a mate during the brief breeding season may be difficult. Therefore, it is hypothesized that acoustic communication plays an important role in locating and identifying a mate. Female leopard seals produce broadcast calls during the breeding season, but only for a brief period. In contrast, male leopard seals become highly vocal prior to and during the breeding season, and produce highly stereotyped underwater vocalizations for long periods each day. Their calls include low-frequency tonal calls, narrowband and wide-band high frequency pulses, and frequency-modulated calls ranging from 50 Hz to 8 kHz. 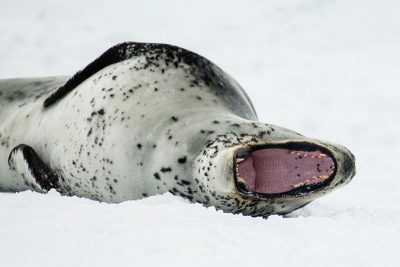 The vocal repertoire of male leopard seals has individual and age-related differences- the seals share common sounds but combine them into individually distinctive sequences. There is also geographic variation in male vocalization types. Leopard seals are one of the top predators in the Antarctic ecosystem, feeding on a diversity of prey. Photo by Andrew Shiva, used under Creative Commons Attribution-Share Alike 4.0 International license. Leopard seals also produce vocalizations in association with agonistic interactions. Captive leopard seals were found to produce underwater growls and blast sounds in association with aggressive behaviors such as lunging (with mouth open, teeth exposed) and parallel swimming. Hauled-out leopard seals that have been approached by humans have also made explosive, broadband vocalizations termed “blasts”, and “roars”. Kriess, C. M., Boebel, O., Bornemann, H., Kindermann, L., Klinck, H., Klinck, K., … Van Opzeeland, I. C. (2013). Call characteristics of high-double trill leopard seal (Hydrurga leptonyx) vocalizations from three Antarctic locations. Polarforschung, 83(2), 63–71.